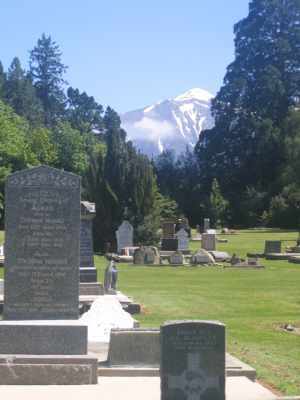 The rural cemeteries of Canterbury, on New Zealand’s South Island, are often in secluded, scenic locations. Springfield Cemetery, serving the populations of Springfield and the surrounding farming area of the Malvern Hills (including Annat, Kowai, and Sheffield), is no exception. Memorial plaques can be found both inside the church and the lychgate – these are listed and illustrated in the St Peter’s Church blog post. High-resolution photographs of the grave are available, plus one or two of the cemetery/church if applicable. This includes a full transcription for those stones that are hard to read or eroded. BONNOR, Charlie (d. 13th December, 1894). Buried with his brothers and sisters. CARRINGTON, Gerard Nelson (d. 22nd August, 1926). Grave plot also has a memorial plaque from the Canterbury Mountaineering Club. CARSON, William (1883 – 1950). Buried with “wee Sybil aged 8 months”. CRAIGHEAD, Helen (d. 5th January, 1892). Mother of David Craighead, farmer at Russell’s Flat. Helen and her husband John (also this headstone) came over to New Zealand from England aboard the “Cashmere” in 1851. The passenger list shows the family as: Helen (44), John (44 – Ploughman), Alexander (11 – Farm Labourer), Margaret (8), Thomas (5), David (2). HALL, Reginald William (d. 1st March, 2003). Priest. HENRY, Arthur (d. 1st Nov, 1924). Born at Carmeen, County Monaghan, Ireland, and came to New Zealand aboard the ship “Carisbrook Castle,” with his father, the late Mr. John Henry, of Russell’s Flat, who died in 1892. McILRATH, Hamilton (d. 24th July, 1915). Born at Killinchy, County Down, Ireland, in 1839. Came to New Zealand in 1863 via Melbourne. Married Eliza Jane Atkinson. MILLIKEN, John (d. 16th September, 1920). 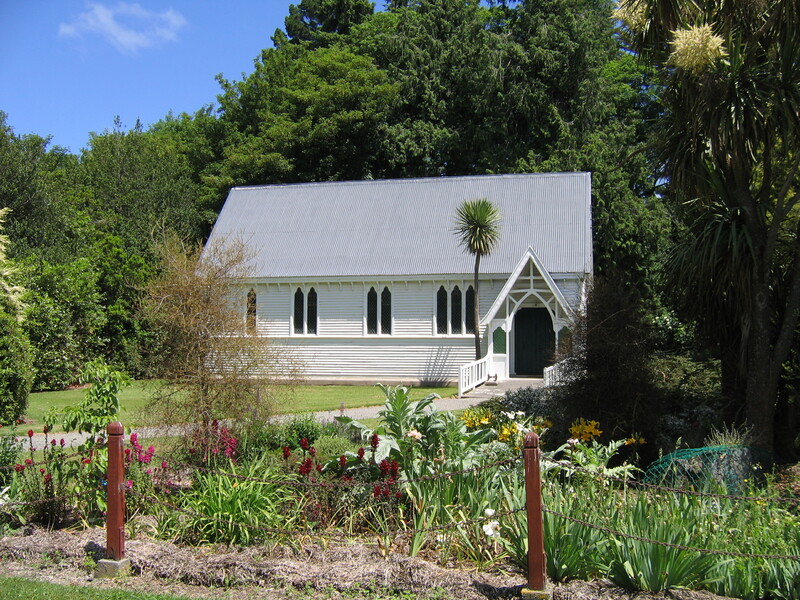 John Milliken arrived in New Zealand in 1881 with his wife Elizabeth. They had 12 children, 6 of which appear to have been born in New Zealand – Ivy Iloine (1890), Nina Sylvaline (1892), William Thomas (1894), Gladys Amelia (1896), Myrtle Doris (1900), Albert Edward (1902). MILLIKEN, Robert Eric (d. 17th April, 1943). Killed in action. MILLIKEN, Vina Sylvia (d. 24th April, 1970). Born Nina Sylvaline (NZ BMD) 1892. MILLIKEN, William Thomas (d. 28th March, 1918). Killed in action in Palestine. MORRIS, Samuel (d. 16th March, 1909). Strangely, two headstones, both identical, lie on the spot – broken in the recent earthquake. MORTEN, James G (d. 23rd February, 1892). Born in Boston, USA. Headstone erected by the Brothers of the Masonic Lodge (Malvern), of which he was a member. NEWMAN Family Stone – Edward Henry d. 1935, Catherine Margaret (nee Poole) d. 1960, Catherine Anne d. 1968, and Edward Spencer d. 1968. POPPLE, William Terrington (d. 22nd June, 1925). Born in the East Riding of Yorkshire, in 1841. He came to New Zealand in 1862 aboard the ship “Queen of the Mersey”, eventually settling in Sheffield in 1871. He married Mary Ann Leigh in 1871. Son George Leigh Popple – Cenotaph record. PRATT, Alfred (d. 20th March, 1944). Fell in battle at Cassino, Italy. PRATT, Richard Thomas (d. 27th March, 1922). Member of the Canterbury Regiment. RODGERS, Cornelius Henry Valentine (d. 12th April, 1941). “He journeyed to Mt Torlesse as a baby in a bullock dray”. RODGERS, William (d. 5th October, 1889). Was one of the first settlers, who purchased land in the Kowhai Bush towards the end of the 1850s, along with Henry Williamson (see below). RUTHERFORD, Agnes May (d. 16th October, 1883). Infant daughter of George and Agnes Rutherford (below). RUTHERFORD, Agnes Miller (d. 21st January, 1884). Died age 23. Nee Barr. RUTHERFORD, George (d. 22nd December, 1918). Born in Australia (Victoria) in 1850, and came to New Zealand with his parents in 1860. Educated at Christ’s College, was on his father’s run at Leslie Hills for some years, and then moved to the Dalethorpe station at Russell’s Flat in 1873. George married Miss Agnes Miller Barr in 1877. SMITH, Harold Dowling (d. 10th January, 1932). The son of Mr Harry Smith a school inspector formerly of Greymouth, Harold (27) a school teacher) died in the vicinity of Harman’s Pass while on a tramping trip from the West Coast to Canterbury with two fellow school teachers. According to newspaper reports of the day Charles Bernard Robbins (27), was found to have sustained injuries from a bad fall after which he fell in the stream and drowned or froze to death, while Harold Smith had frozen to death after losing his pack in a blizzard. The third tramper, Keith Loney (26), was found safe by searchers thanks, he says, to an extra blanket he’d packed. Loney related his story of survival to the newspapers. TAYLOR, Emily (d. 25th April, 1920). Buried with several of her young children. WILLIAMSON, Henry (d. 1st July, 1900). Along with William Rodgers (see above) was one of the first settlers in the region. Great effort! Well done…. i know how much work goes in to editing this sort of thing! Keep up the terrific work, it’s appreciated. I am from Sweden, and search for my relatives and their children in Auckland. Please, can you help me to find my relatives? She died 1912, and he died 1946. Victor Laurence 1896-1951 and Alma Isabella 1899-1973. You asked me for more, and I was LYCKY!!! She was married before, but her husband, James Nicholas Norman, died, only 37 years old. and her brother, dvs William John Nicholas Norman born 1889. They were only 8 and 2, when their father died. Victor Laurance Johnson, born 1896 and Alma Isabella Johnson, born 1899. 29, 23, 16 and 13.. and maybe she had one more child? Victor Laurence was a marine engineer, the same as his brother-in-law, Joseph Alfred Anderson (Ilmo), the husband of Alma Isabella. Victor Laurence died 30nov 1951. He was cremated. died 26 Jan 1973 aged 73yrs. R.I.P. Maybe give them my e-mail-adresse??? 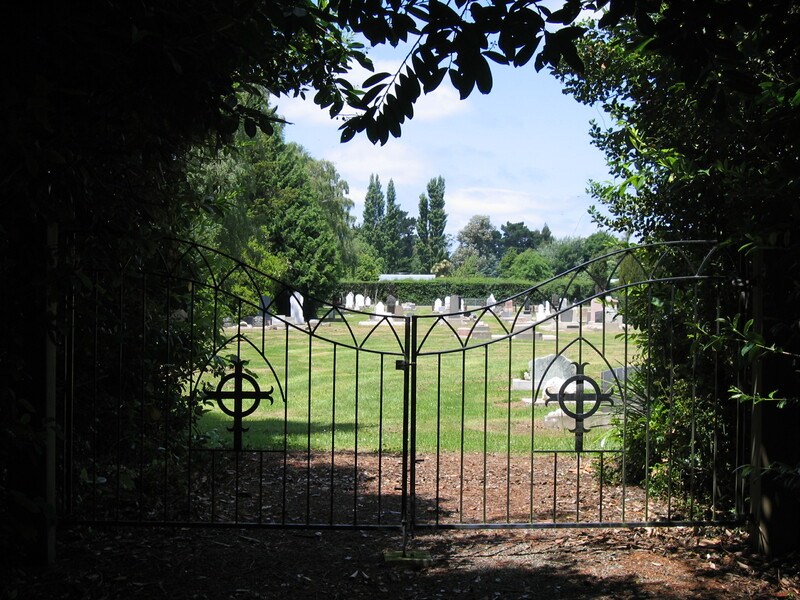 Greetings, It’s good to see all the effort and results you have put into recording these cemeteries..
See Charles and Elizabeth Mary Rae nee Mactigue, lived Kowhai Bush and buried Springfield. Connected by kin to; Maurice Leslie Rae born 12 March 1935 and a Commonwealth Games 100-200 metre Champion living New Lynn Auckland. Thanks for getting in touch – I’ll have a look for you.